I'm selling my well-loved 1986 200 Avant Quattro Turbo. 130,000 miles, Taxed, MoT'd, and in regular use. 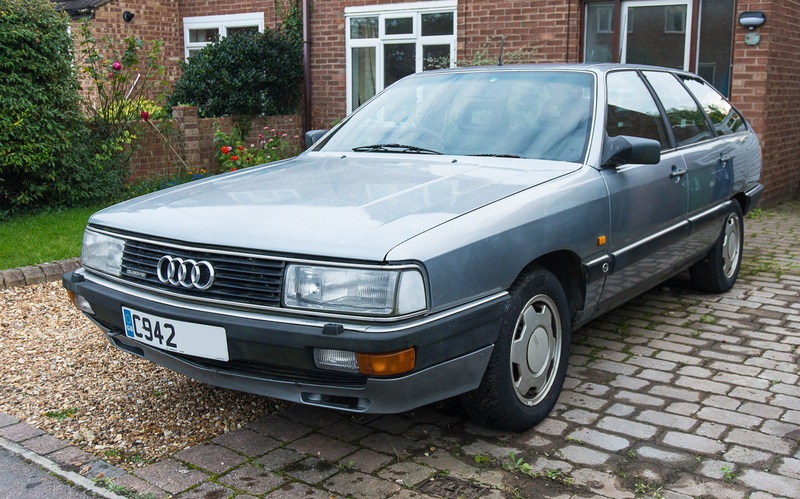 This example is one of only four Audi 200 Avant Quattro Turbos still on the road in the UK. Mechanically it is good condition with lots of work done over the past few years and is still used regularly. The exterior can charitably be described as tired, but thanks to the fully galvanised body, rust is limited to stone chips and other minor spots. The underside is solid and almost like new thanks to extensive wax treatment over its life. From 1986 to 1999 the car seems to have belonged to a certain John Haynes OBE and was in regular use as attested to by a full set of service stamps to 124,000 miles. It was then stood gathering dust in the depths of the Haynes Motor Museum until 2011 when the previous owner to me bought it. The previous owner did some electrical repairs, drove it about 500 miles and then sold it to me in 2013. Since then I've driven it about 5,000 miles, had it serviced regularly and had more extensive work carried out. I bought this car for historic interest alongside my Ur, but marriage and imminent arrival of a new family member means I can't sensibly justify keeping it anymore. As far as price goes, these are rare and prices are hard to pin down, but they certainly seem to be going up in value at present. So I've picked a fairly arbitrary price that I'd be happy with for starters. I'll consider any other reasonable offer but am in no huge hurry to sell. I'm also selling an collections of spares (including a brand new Michelin-man hose, ABS sensor, ABS control unit, rear suspension parts etc. etc. ), a set of Bentley manuals (for the US Audi 5000 equivalent) and the original wiring diagrams (in German!). These are not included with the car - if interested please make me an offer. Front suspension and subframe rebuild, inc new shocks, lower tie rods, upper ball joints, subframe bushes and engine and gearbox mounts. New brake master cylinder and hydraulic brake accumulator. New fuel pump, fuel accumulator and fuel injectors. New rear disks, pads and calipers. Original Audi parts or OE parts from ZF/Lemforder used where available. Rare parts sourced from Germany, USA, France and Slovenia. Starts first time, every time, even when it's sub-zero (ignoring flat batteries). Currently has an almost new set of Continental WinterContact TS 850 winter tyres. Paintwork in tired condition with carzing, some minor rust sports and what appears to be a previous minor dent repair on the rear quarter showing blistering. I've tried to show these in the photos. Air-con doesn't work - no gas (what did you expect?) but the blower and heater controls do work. Propshaft could do with better alignment to get rid of a residual slight rumble at 30/60/90mph. Battery goes flat after about a month of being stood. Not sure if this is a fault or just the radio and seat memory back-up current slowly draining it. Drivers seat side bolster has been scuffed through and needs repair. Relay for electric windows occasionally needs wiggling before they'll work. Probably needs a new relay or the contacts cleaning. I can show you what's involved. I've not been brave enough to try opening the sunroof. It's currently shut and doesn't leak - you can try opening it after you've bought the car. PM me if you want more info or would like to come and see the car in Cambridge, but don't expect me to let you drive it unless you either pay for it or can prove you have fully comprehensive insurance and a licence. Last edited by martinb; 28-09-17 at 11:02 PM. Would you consider a swap/part exchange for a Volvo 240 Turbo estate? Sadly, I'm trying to reduce the number or cars in my life, so I'm not really up for a swap/px. I'd happily carry on driving this car if it was up to me! Colour is LY5V Sapphire Mettalic (or a slightly faded and crazed version of it). Now sold - thanks all for your interest.